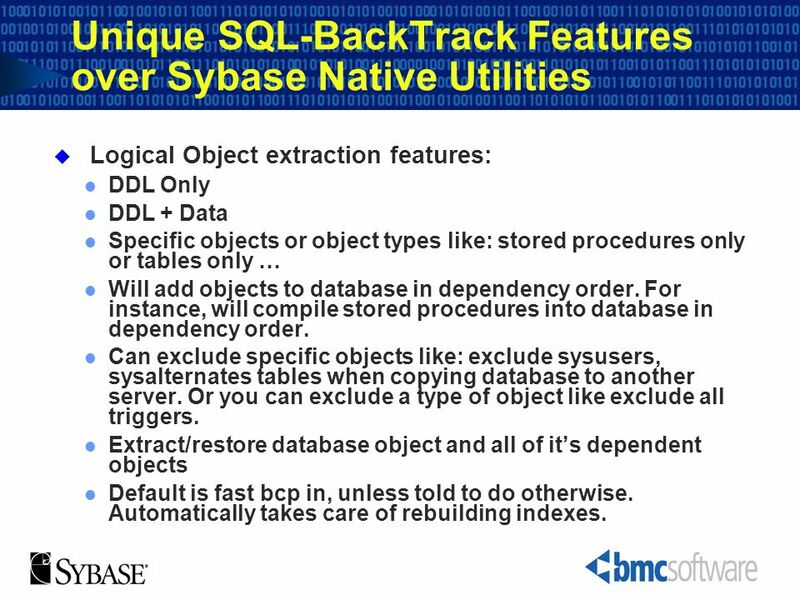 5 SQL-BackTrack automates the entire process! 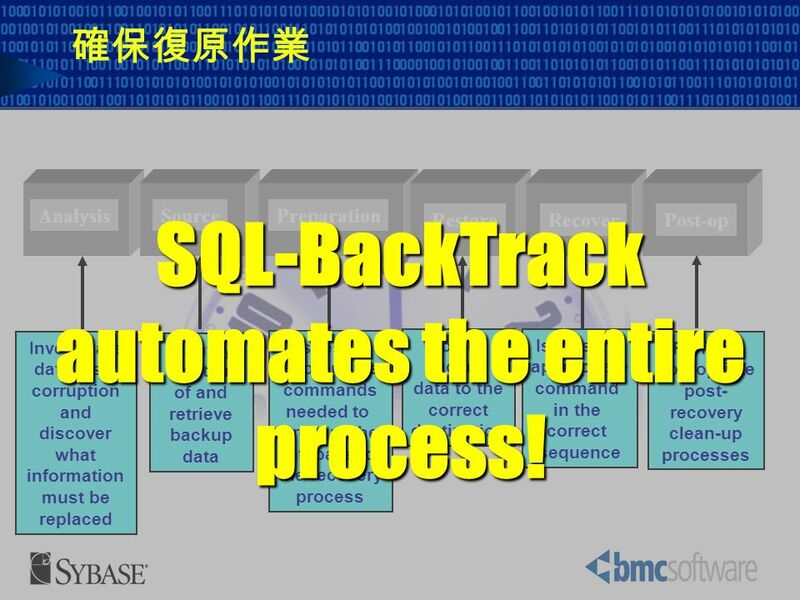 確保復原作業 SQL-BackTrack automates the entire process! Analysis Source Preparation Restore Recover Post-op Identify location of and retrieve backup data Issues the appropriate commands needed to prepare the database for the recovery process Copies backup data to the correct destination command in the sequence Perform appropriate post-recovery clean-up processes Investigate data loss/ corruption and discover what information must be replaced The recovery process is more then just restoring files to disk from tape. The recovery process is the total time from the time it takes to realize something is wrong, until the database is backup up and running in a stable state. Traditional Recoveries includes these 6 steps: Analysis – determine what is needed to recover the database Source – determining what files are needed to recovery and where they are. Are they on tape, if so which tapes Preparation – does the database require special preparation to do the recovery. If so, what are the commands to issue to the database? Restore – this is the step that many vendors use in benchmarks. Of course this is the easiest step, it is simply the copy of files from tape to disk. Beware of benchmarks that just show the speed of this step and tout it as a recovery. 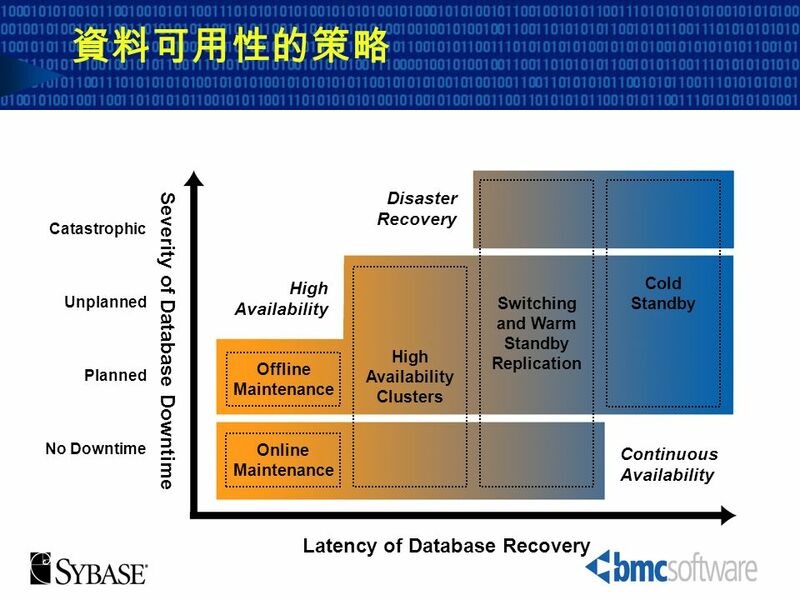 Recovery – A database must go through a sometimes complex set of steps to do a total recovery. Logs may need to be applied. If so, the order and the commands issued to recovery them are important. Post-op – A database may need some clean up or post recovery operations like backing up the database immediately so that future recoveries are not jeopardized. All of these steps are important and when done manually are prone to error. 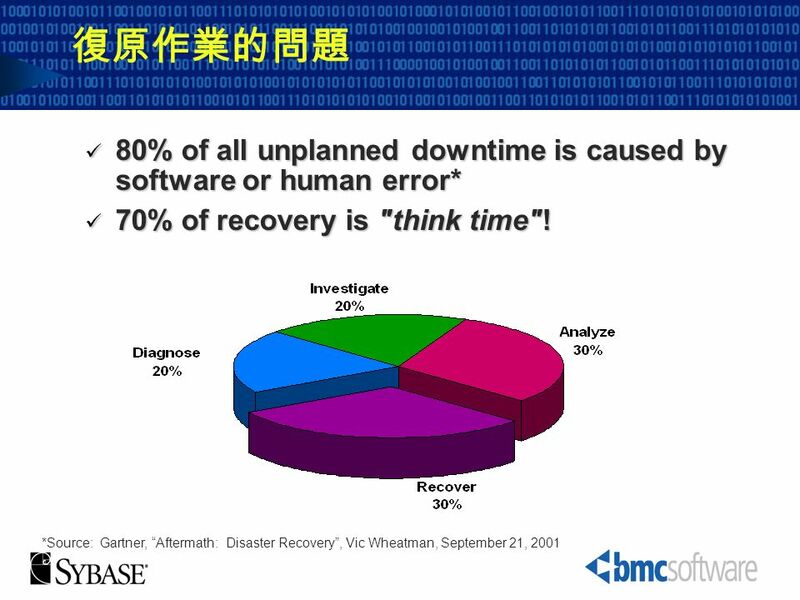 A human error can jeopardize the entire operation and can force the recovery to start over from the very beginning losing valuable time during crititcal database down situation. SQL-BackTrack automates these steps, so that human error is minimized or eliminated. This ensures that recoveries are correctly and therefore in the minimum amount of time each and every time. Determine which database to recover Determine where backups are located If the backups are striped locate all the stripes Order the backups in the required sequence to be applied. Determine the recovery type: physical, transaction log , is there a specific point in time for the recovery If it is a point in time recovery determine the transaction log backups to be applied. Start an isql session Issue load database Issue load transaction for all the transaction log backups If the recovery is PIT issue load transaction with until_time Issue online database or online for standby access Determine if the database and application are ready for production use. Scenario 1: Recovery of a database from a backup (Native utility) Determine which database to recover Determine where backups are located If the backups are striped locate all the stripes Order the backups in the required sequence to be applied. Determine the recovery type: physical, transaction log , is there a specific point in time for the recovery If it is a point in time recovery determine the transaction log backups to be applied. Start an isql session Issue load database Issue load transaction for all the transaction log backups If the recovery is PIT issue load transaction with until_time Issue online database or online for standby access Determine if the database and application are ready for production use. 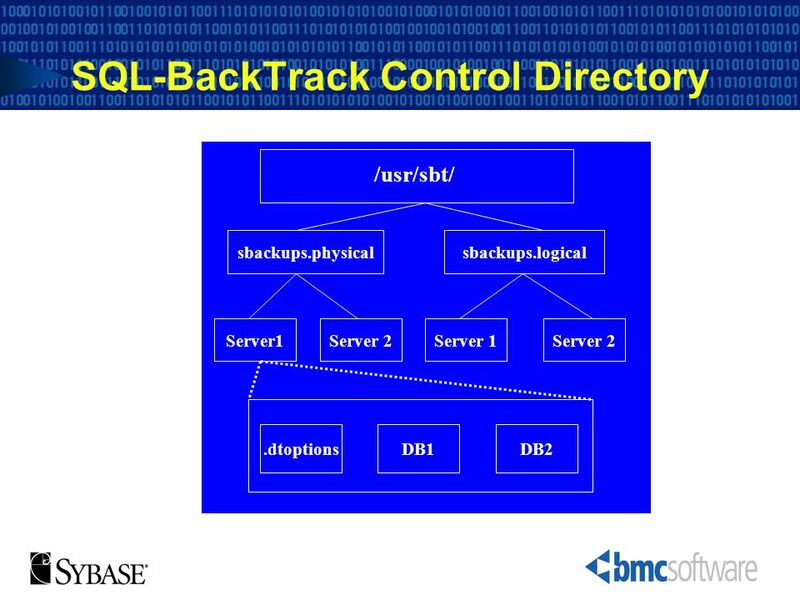 Steps Required for SQL BackTrack: 1. Determine which database to recover 2. Execute dtsrecover with the control file for the database giving the necessary options for PIT and database status after recovery if any or none. ********************************************************************* Scenario 2: Recreate a production database on a different server (Native utility) Start an isql session to connect to the new server where new database has to be recovered Determine the size of the original database. Create the new database for load. Find out the database options for the original database Issue sp_dboption for each and every database option 2. Execute dtsrecover with the control file for the database giving the necessary options for PIT, database status after recovery and the new database name to be created . 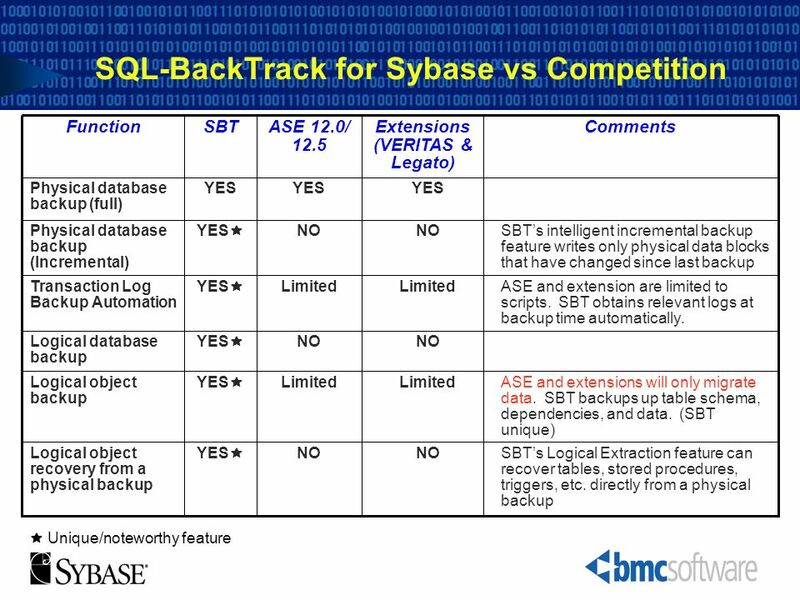 7 SQL-BackTrack reduces this effort to 2 STEPS!! 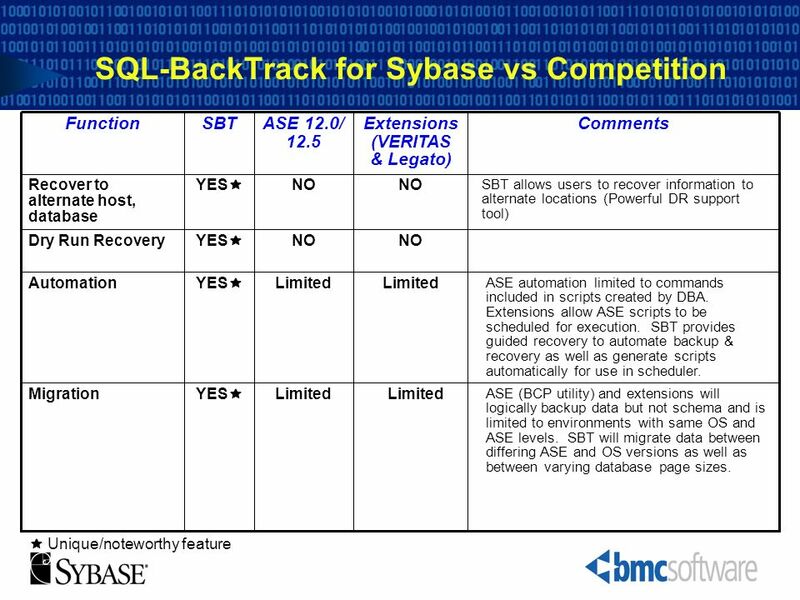 Why SQL-BackTrack? 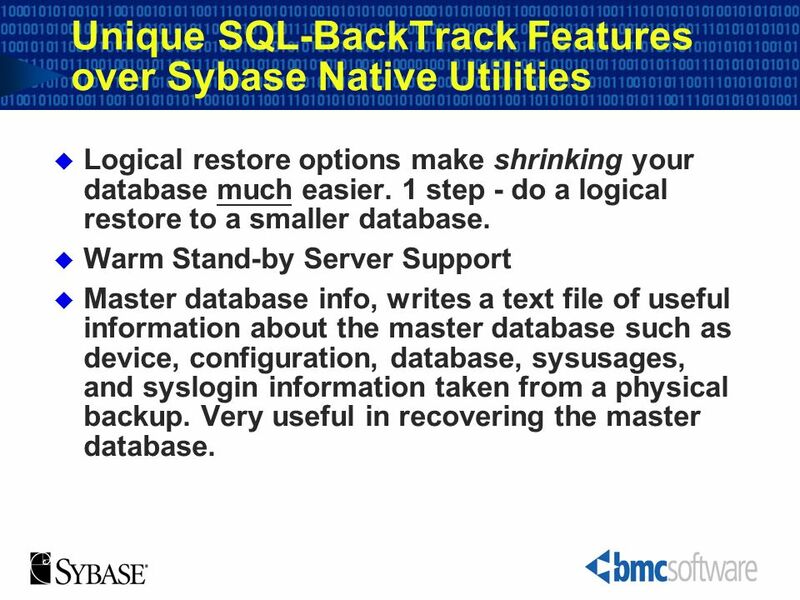 An example of a recovery of a Sybase database using the native utility Determine which database to recover Determine where backups are located If the backups are striped locate all the stripes Order the backups in the required sequence to be applied. Determine the recovery type: physical, transaction log , is there a specific point in time for the recovery If it is a point in time recovery determine the transaction log backups to be applied. Start an isql session Issue load database Issue load transaction for all the transaction log backups If the recovery is PIT issue load transaction with until_time Issue online database or online for standby access Determine if the database and application are ready for production use. 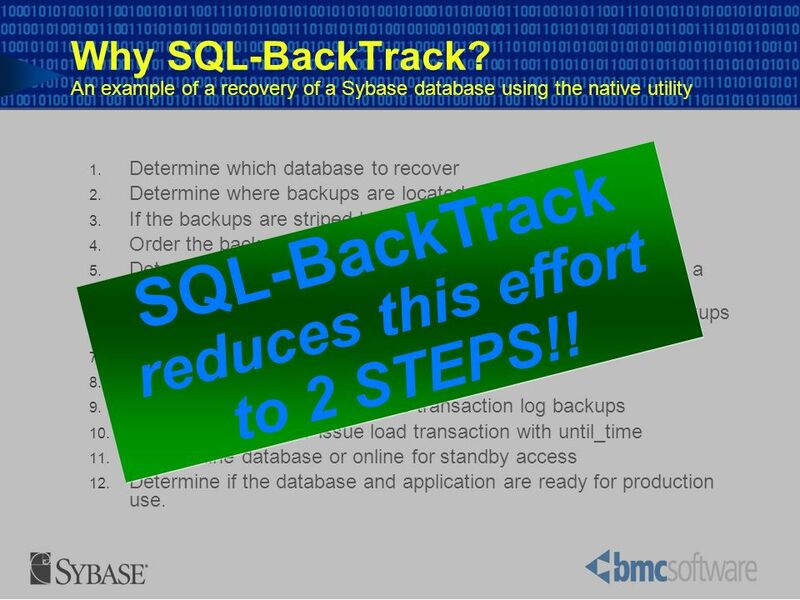 SQL-BackTrack reduces this effort to 2 STEPS!! 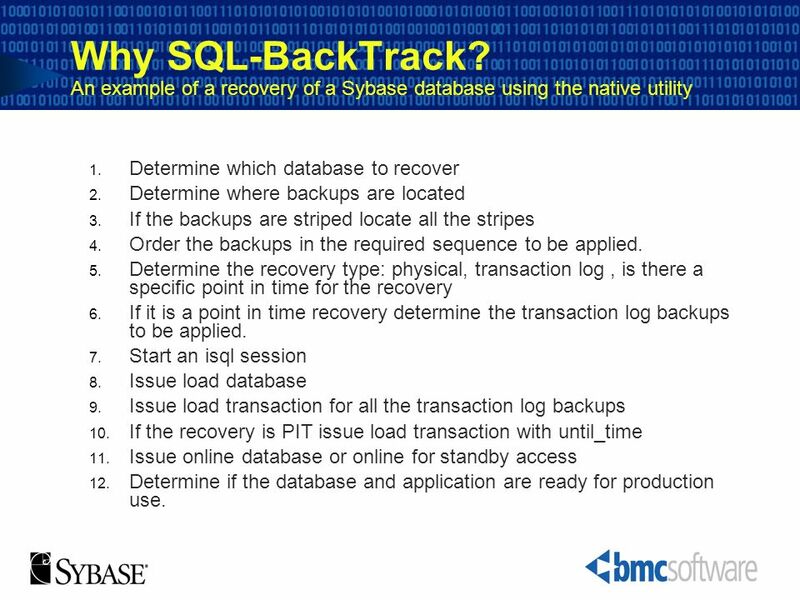 Scenario 1: Recovery of a database from a backup (Native utility) Determine which database to recover Determine where backups are located If the backups are striped locate all the stripes Order the backups in the required sequence to be applied. Determine the recovery type: physical, transaction log , is there a specific point in time for the recovery If it is a point in time recovery determine the transaction log backups to be applied. Start an isql session Issue load database Issue load transaction for all the transaction log backups If the recovery is PIT issue load transaction with until_time Issue online database or online for standby access Determine if the database and application are ready for production use. 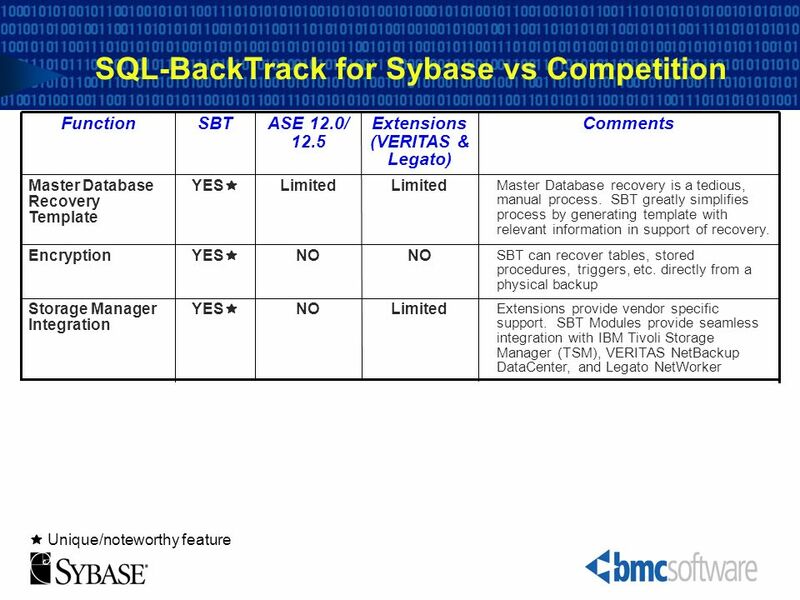 Steps Required for SQL BackTrack: 1. Determine which database to recover 2. Execute dtsrecover with the control file for the database giving the necessary options for PIT and database status after recovery if any or none. ********************************************************************* Scenario 2: Recreate a production database on a different server (Native utility) Start an isql session to connect to the new server where new database has to be recovered Determine the size of the original database. Create the new database for load. Find out the database options for the original database Issue sp_dboption for each and every database option 2. Execute dtsrecover with the control file for the database giving the necessary options for PIT, database status after recovery and the new database name to be created . The SQL-BackTrack programs are a collection of executables that perform the backup and recovery tasks as well as some administration tasks. 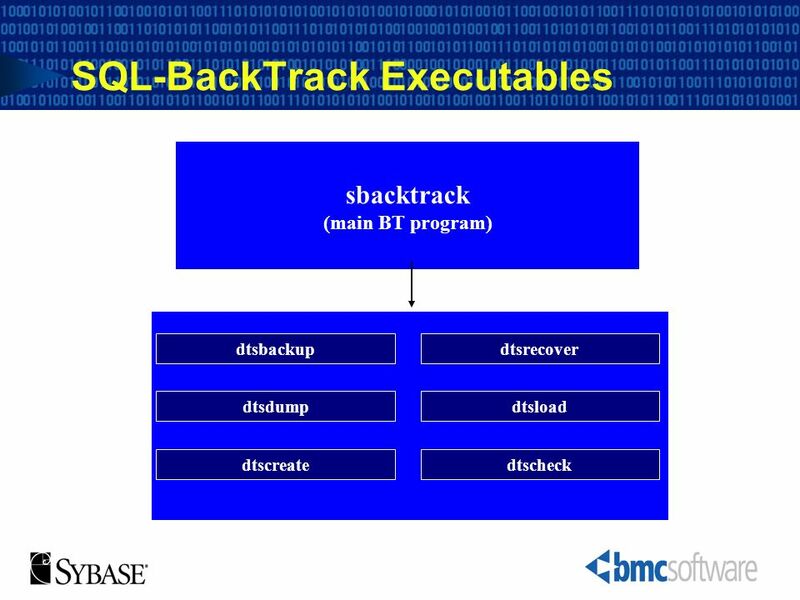 The main SQL- BackTrack program is sbacktrack. 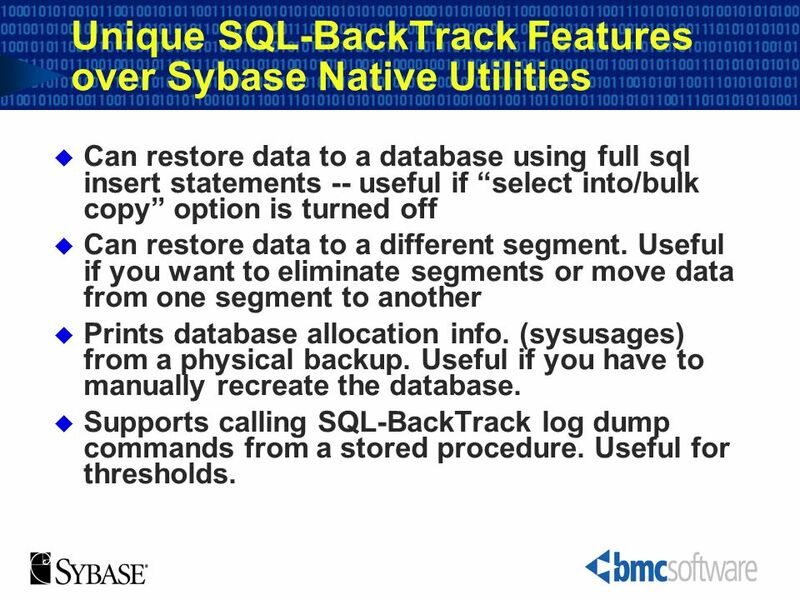 Sbacktrack calls an interactive menu interface that allows the user to access other SQL-BackTrack programs in an easy to use manner. 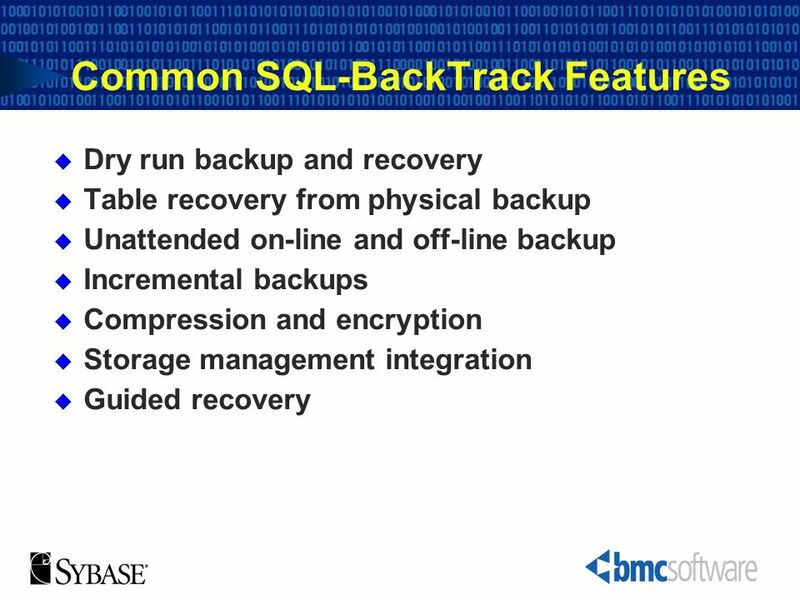 Key programs that are part of SQL-BackTrack include dtsbackup, dtsrecover, dtsdump, dtsload, dtsanalyze and dtscheck. Master database recovery Needs to be rebuilt, if lost or damaged Generates Master Database Recovery template script to recover Remote administration Warm stand-by server support Table level recovery includes recovery of dependent objects (triggers, etc.) SBT will automatically identify dependent objects such as triggers when performing a table-level recovery and recover these dependent objects as well. 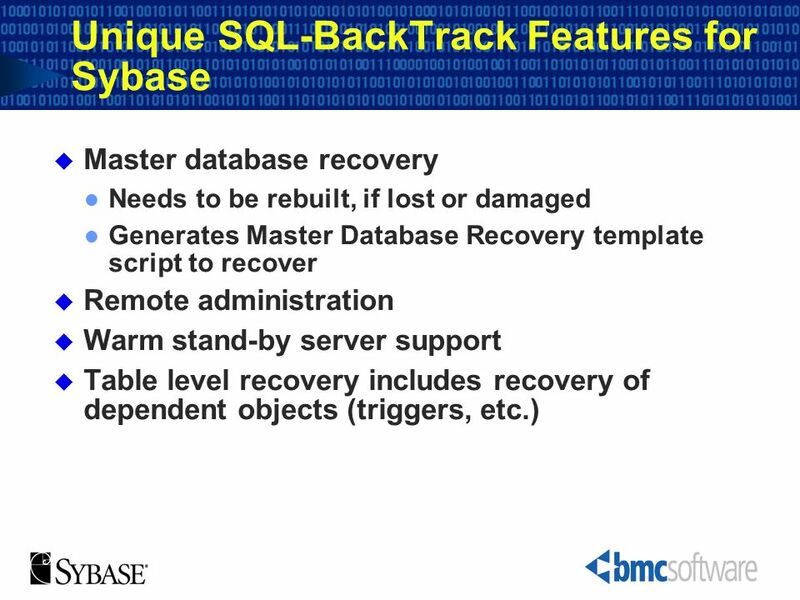 With SQL-BackTrack you can generate a Master Database Recovery template that contains the device creation steps necessary to reconstruct the Master Database. This template can be used for re-creating the Master Database. 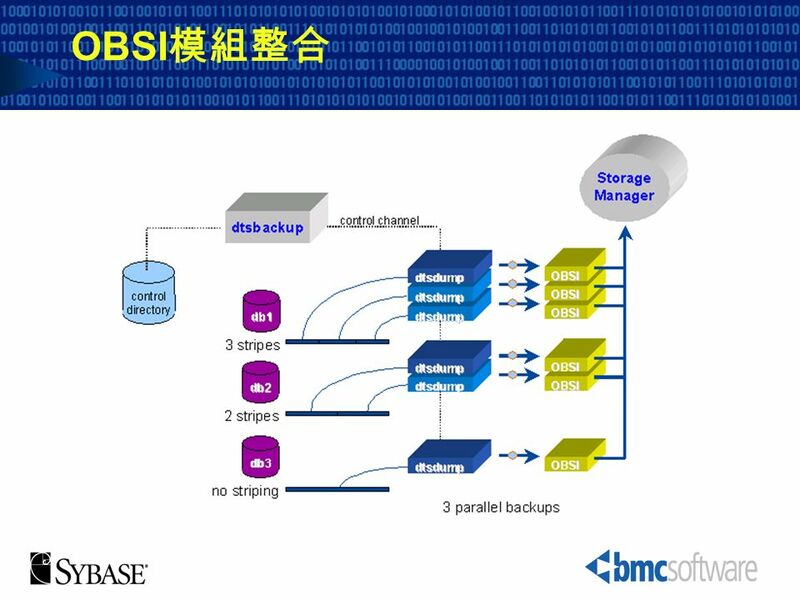 Online Database consistency checking during the backup process is provided by DBV. This supplements the function provided by dbcc. 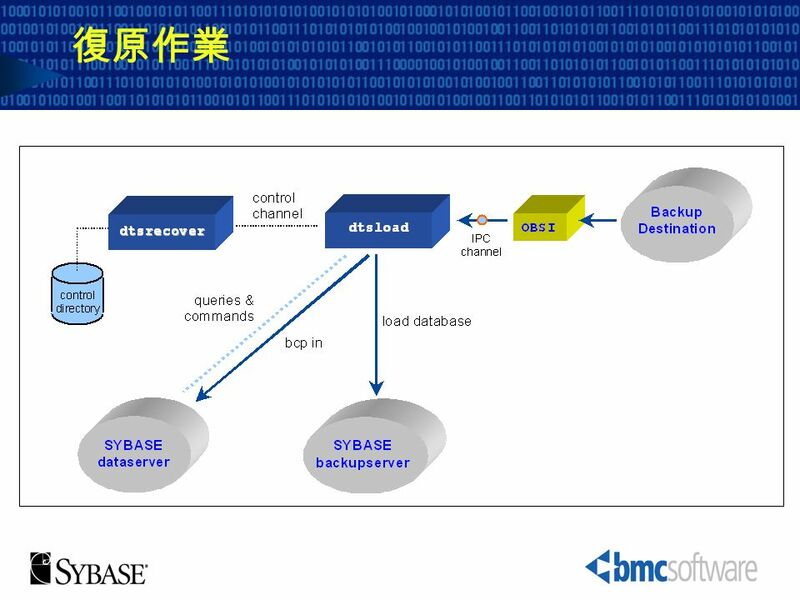 (technical info taken from DBV User’s Manual is for reference only) Sybase provides the Database Consistency Checker (dbcc) utility for checking and repairing database consistency problems. Regular usage of dbcc is recommended for ensuring and maintaining database consistency. However, running dbcc can significantly degrade database performance. As database sizes grow, the time required to run dbcc also grows, often prohibitively. Database Verifier enables automatic and regular consistency checking without incurring a performance penalty or requiring massive disk storage. 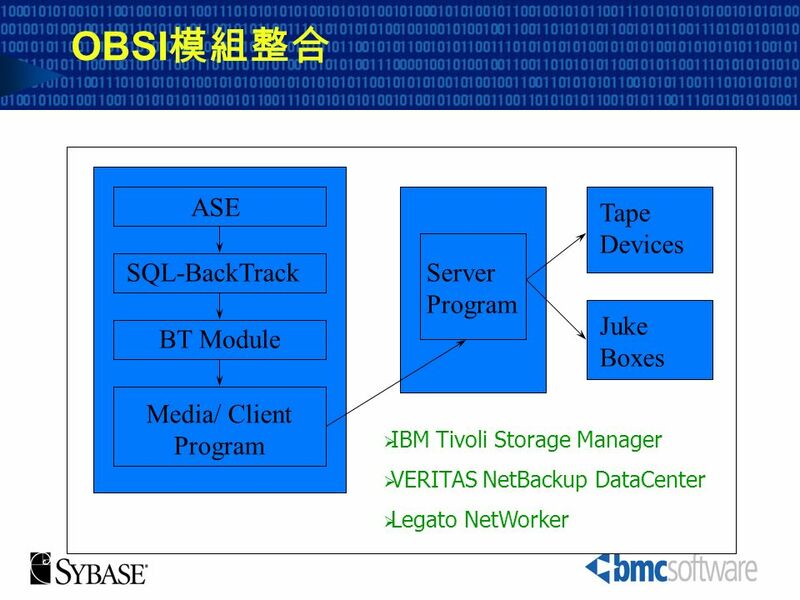 It does this by analyzing the SQL-BackTrack backup data either during backup or offline. As Database Verifier analyzes the backup data, it detects any consistency problems that can prevent a backup from being reloaded. It also detects most of the errors that cause consistency problems with the data. The purpose of Database Verifier is not to replace dbcc, but to provide a fast screening for database consistency. If Database Verifier reports a database inconsistency, you should then run dbcc to verify and possibly fix the problem. If a backup passes the Database Verifier screening with no errors, it can be recovered. Logical Object extraction features: DDL Only DDL + Data Specific objects or object types like: stored procedures only or tables only … Will add objects to database in dependency order. For instance, will compile stored procedures into database in dependency order. Can exclude specific objects like: exclude sysusers, sysalternates tables when copying database to another server. Or you can exclude a type of object like exclude all triggers. Extract/restore database object and all of it’s dependent objects Default is fast bcp in, unless told to do otherwise. Automatically takes care of rebuilding indexes. Logical restore options make shrinking your database much easier. 1 step - do a logical restore to a smaller database. Warm Stand-by Server Support Master database info, writes a text file of useful information about the master database such as device, configuration, database, sysusages, and syslogin information taken from a physical backup. Very useful in recovering the master database. Can restore data to a database using full sql insert statements -- useful if “select into/bulk copy” option is turned off Can restore data to a different segment. Useful if you want to eliminate segments or move data from one segment to another Prints database allocation info. (sysusages) from a physical backup. Useful if you have to manually recreate the database. Supports calling SQL-BackTrack log dump commands from a stored procedure. Useful for thresholds. sbackups.logical sbackups.physical /usr/sbt/ Server1 Server 2 Server 1 .dtoptions DB1 DB2 Figure 1-6 in the student manual, shows a Unix server Control Directory structure. 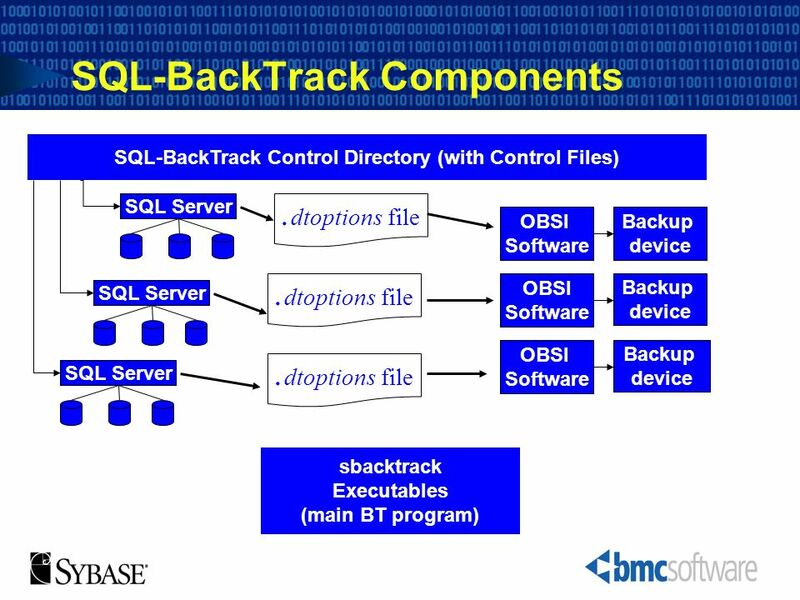 SQL-BackTrack expects the hierarchy as viewed in figure Figure 1-6. SQL-BackTrack will create at least one of sbackups.physical and/or sbackups.logical control directories as requested by the user. Within these directories, directories representing each individual Sybase SQL-Server are created. The control files exist within the Server Directories. Control files are created for specific databases. For example, if you will always be backing up information in Publications you could create a Control File called pubs. 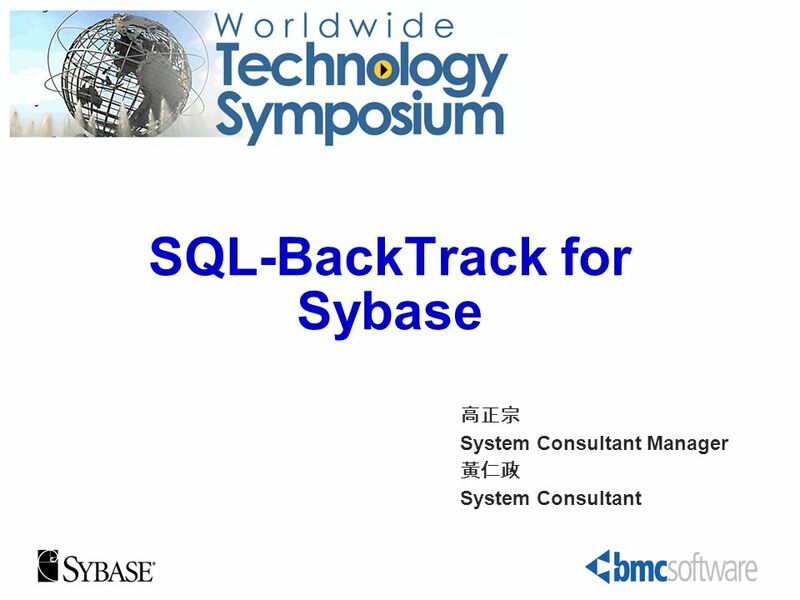 Download ppt "SQL-BackTrack for Sybase"
Chapter 20 Oracle Secure Backup. Module 8 Importing and Exporting Data. Module Overview Transferring Data To/From SQL Server Importing & Exporting Table Data Inserting Data in Bulk. J. Espen Stokke Professional Services Manager. NetBackup 6.0 What’s New. What’s New in NetBackup 6.0 Management and Reporting Core Product Enhancements Disk Management and Optimization Additional NetApp. Backup and recovery Basics of Backup and restoration Types of recovery Defining strategy Starting up and shutting down 80/20 rule SLA’s. FlareCo Ltd ALTER DATABASE AdventureWorks SET PARTNER FORCE_SERVICE_ALLOW_DATA_LOSS Slide 1. Keith Burns Microsoft UK Mission Critical Database. A+ Guide to Software, 4e Chapter 4 Supporting Windows 2000/XP Users and Their Data. Backup The flip side of recovery. Types of Failures Transaction failure –Transaction must be aborted System failure –Hardware or software problem resulting. Harvard University Oracle Database Administration Session 2 System Level. 70-290: MCSE Guide to Managing a Microsoft Windows Server 2003 Environment Chapter 12: Managing and Implementing Backups and Disaster Recovery. Advanced Databases DBA: Backups 1. 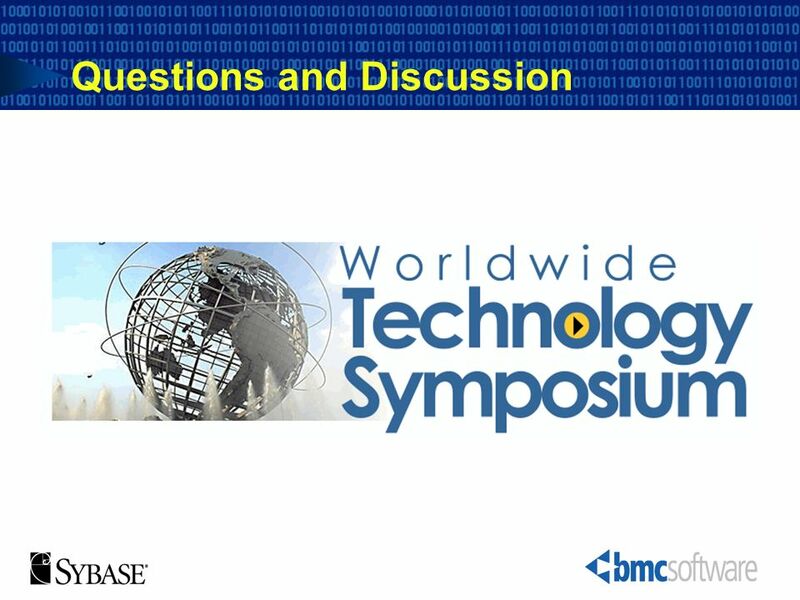 Advanced Databases Agenda Define backup Discuss Backup Terminology Explain various backup and restore options in Oracle. Module 12: Backup and Recovery. 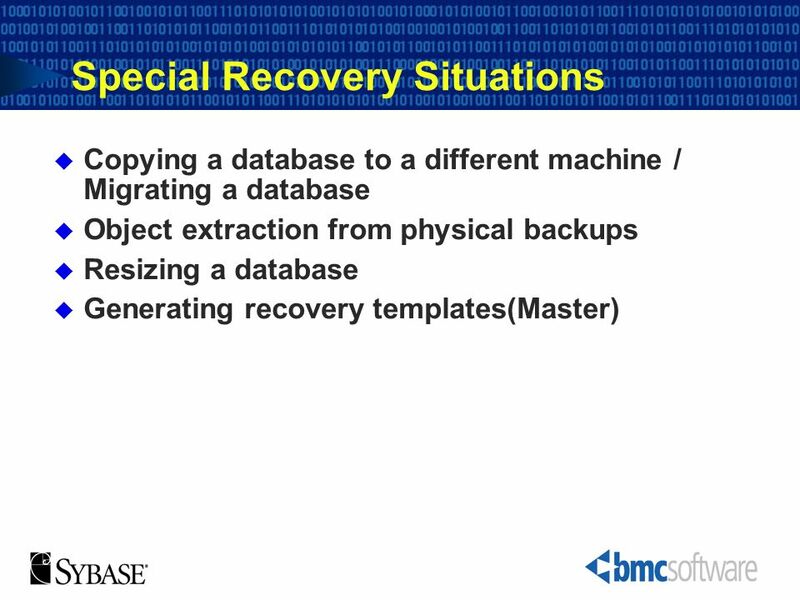 Overview Backup and recovery methods available in Oracle and SQL Server 2008 Types of failure Types of recovery Formulating. Module 7: Restoring Databases. Overview SQL Server Recovery Process Preparing to Restore a Database Restoring Backups Restoring Databases from Different. Backup and Recovery Part 1. Backup Concepts. Introduction Backup and recovery procedures protect your database against data loss and reconstruct the data, should loss occur. The. 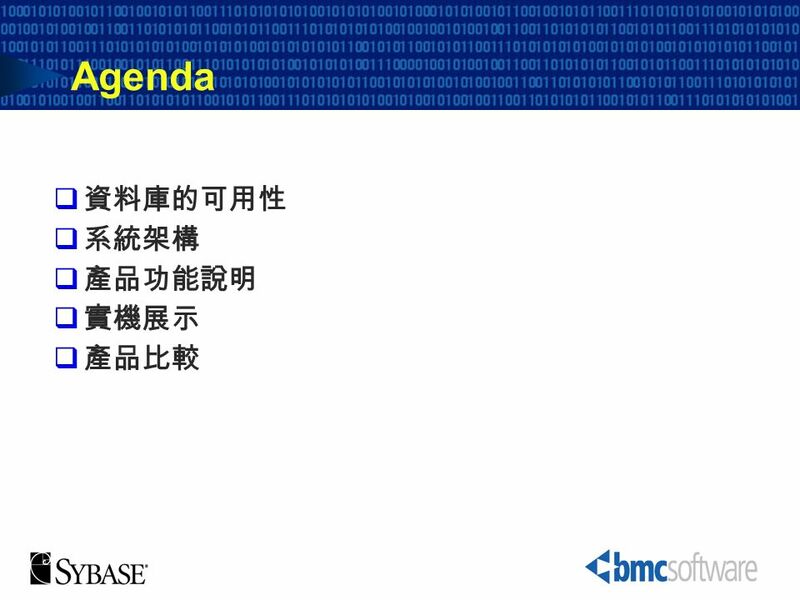 AGENDA Tools used in SQL Server 2000 Graphical BOL Enterprise Manager Service Manager CLI Query Analyzer OSQL BCP. Agenda  Overview  Configuring the database for basic Backup and Recovery  Backing up your database  Restore and Recovery Operations  Managing your. PPOUG, 05-OCT-01 Agenda RMAN Architecture Why Use RMAN? Implementation Decisions RMAN Oracle9i New Features.